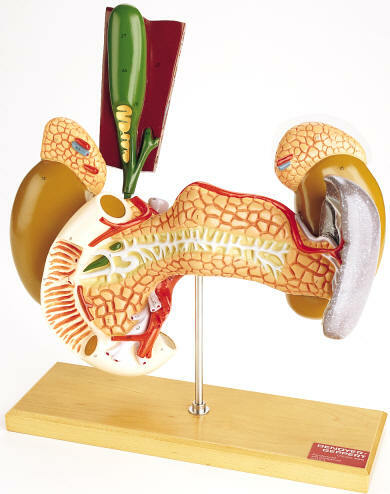 Three times life-size, this vinyl-plastic model replicates the pancreas, duodenum, gallbladder, spleen, and kidneys with adrenals. Dissections of the pancreas, duodenum and gallbladder let you trace the pancreatic, cystic and bile ducts. Major blood vessels including the portal vein are depicted. 59 hand-numbered structures are defined in the accompanying key. Model pivots on hardwood stand.